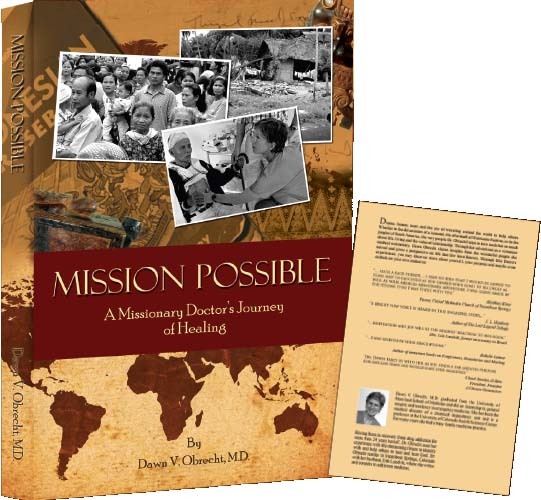 Mission Possible, A Missionary Doctors Journey of Healing :: Dawn V. Obrecht, M.D. Available now from Amazon.com or CreateSpaceTM. "Mission Possible: A Missionary Doctor's Journey of Healing" won an honorable mention in the the 2012 Eric Hoffer Legacy Nonfiction category. The book also won won honorable mention in the 2012 Montaigne Medal. Each year the Eric Hoffer Award for short prose and books highlights salient writing, as well as the independent spirit of small publishers. This book also won the 2012 Colorado Inependent Publishers Association EVVY award for Legacy NonFiction. Drama, humor, tears and the joy of traveling around the world to help others. Whether in the devastation of a tsunami, the aftermath of Hurricane Katrina, or in the jungles of South America, the very people Dr. Obrecht helps in turn teach her so much about life, living, and the value of relationship. Through her adventures as a volunteer medical missionary, Dawn Obrecht shares insights from the wonderful people she served and gives a perspective on life that few have known. Through DocDawn's experiences, you may discover more about yourself, your purpose and maybe even embark on your own endeavor. About 250 pages, soft cover. an ebook in most formats. "A bright new voice is heard in this engaging story ..."
"...such a page turner...I had no idea that I would be moved to tears and to laughter as you shared your road to recovery as well as your medical missionary adventure. I was taken aback by the feeling that I was there with you"
"...inspiration and joy will be the reader's reaction to her book." "...I was riveted by your descriptions." "Dr. Dawn takes us with her as she finds a far greater purpose for her life than she would have ever imagined."